Below is a selection of studies showing the outcomes achieved after adding Xenex Robots to the hospital cleaning procedure. 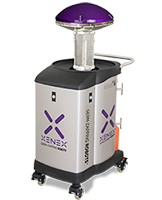 To view more Research & Results on xenex.com, click here. Click here to see a summary of third party research and results demonstrated in Xenex customers’ hospitals and healthcare facilities.